Most teams take level of competition into account when deciding which tournaments to attend. Elite teams choose their schedule almost purely based on what other elite teams will be attending, and even less competitive teams are likely to check out a list of teams who have attended your tournament in the past or see who else has committed to attending this year. Teams usually choose events where they will get at-level games and/or have the opportunity to play teams a tier up. Recruiting teams for a tournament can be extremely challenging, but is crucial to developing a top-notch event. It is also one of the best opportunities to learn about players' and teams' stories, and to help create opportunities for their continued development. How do you convince teams to attend your tournament? Build relationships with players and teams. My friends have been crucial to the success of the events that I have run. In the beginning, they took a chance on my events, and now players who were once their rookies support my work. That relationship gets built over the course of a season, and over many years. Take the time to learn players’ names, to chat with the winning team after the weekend, and to follow teams’ seasons. Investing in the people who attend your events is both wise and extremely rewarding. Contact teams individually - court the teams you want to attend. Do your homework - every year, there is going to be a team or two that has a breakout year. Make it your mission to find those teams before they blow up, and create opportunities for them. Work hard to build an event that teams will want to attend. Get the right teams on board, draw sponsors in, generate excitement about the weekend, and when teams show up, run a quality tournament where they don’t have to worry about any of the logistics or details. Get information to teams early, keep people informed, and answer questions and address concerns in a timely manner. How do you attract top teams to an unproven tournament? Before the season starts, the top teams talk to each other and plan their seasons around each other. Present these teams with opportunities early. It takes time - a great tournament doesn’t get built in one year; it requires years of investment and dedication. Don’t leave the local and regional teams out. It is easy to become consumed with getting the best teams in the country to attend a tournament, but your relationship with the teams around you can be incredibly important to the long-term health of an event. Develop a D-II with play-in potential or run a qualifier tournament. Don’t simply turn your back on the local teams. Develop the “story” behind your tournament. Every tournament has something that makes it special. The tournament's "story" involves your vision for the tournament, your co-organizers, the players and teams who attend your tournament, and your event’s place among a season packed with other tournaments. Develop a vision for your tournament, and build a team of organizers who believe in this vision and who can execute it. How do you keep the top teams coming back? Build relationships (this can't be stated enough times) - a tournament isn’t just about a weekend of ultimate. It’s a stepping stone in teams’ and programs’ development. Take the time and energy to care about the players and teams who attend your event, and the impact your event will have on their season and on their ultimate experiences. For me, that perspective has been a game-changer in the way I think about planning tournaments. Ensure that the level of competition meets people’s expectations (whether this be at the national, regional, or conference level). Run an excellent event - your job as the Tournament Director is to serve the players and teams in attendance. Go above and beyond - every moment of the weekend should be about making sure things go smoothly and troubleshooting problems before they happen. Pay attention to the details - keep the line for the trainer manageable, fill water constantly, report scores every single round, blow the cap horn on time, etc. Communicate well with teams before, during, and after the event. Create an “experience” at your event - the Saturday night BBQ / dance-off at Women’s College Centex is my favorite example of this. How soon do you need to advertise? 6-8 months in advance for an elite level tournament. 4-6 months in advance for a local or regional tournament. What are the best channels for finding teams? Email teams directly - blast everyone, and write individual emails to teams. Post on RSD / USAU message board. Put up a tournament website and keep it updated with information. Contact the teams who have attended your events in the past. Michelle has run 25 tournaments over the past six years. Her work has ranged from local hat tournaments to some of the biggest women's tournaments in the country, and from getting new tournaments off the ground to helping run well-known, established tournaments. 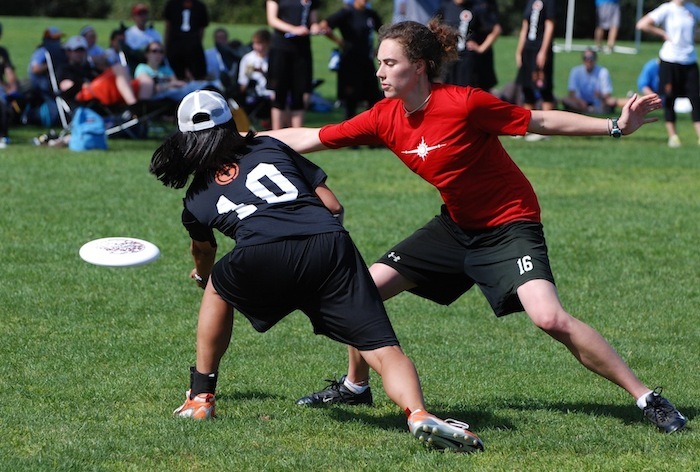 Her favorite tournament as an organizer is Women's College Centex, and she believes that the best tournaments are the events that bring together competition and community.